Delivering musical reviews and editorials of varying quality since 2014. Bristolian trip-hop pioneers Massive Attack have always had their fingers on the trigger in relation to the wider world, be it from working with music’s biggest stars to curating a week long art project in a disused warehouse. They’re the strange kind of group who are as at home live in Wembley Arena or the crumbling masonry of an old textile mill. Their latest music, the Ritual Spirit EP released this week, has been gradually teased through the Fantom app that plays snippets in regards to your heartbeat. It’s all very intriguing as concepts go. 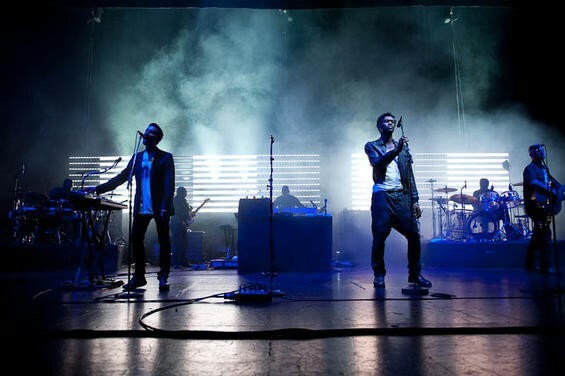 Massive Attack, live in Los Angeles in 2014. But they’ve never been short of relevant opinions, as they demonstrate at tonight’s show at Leeds’s O2 Academy, a trip-hop masterclass shot through with a political intensity. Behind them on stage, large LED screens flash the flags of Middle Eastern countries and American corporation logos in a rapid, red-and-black stark pattern, interspersed with images of the ongoing refugee crisis. Internal displacement is a key topic, as figures of migrant applications, presented in an oddly-disjointed Teletext format, harking back to the early nineties when they were one of the most exciting bands in the country. Real headlines condemning celebrity culture and world leaders – CBB, David Cameron – are interspersed with fake ones, regarding Viking invasions, a refuge in audacity that seems weirdly plausible in the age of the click-bait headline. It’s clunky at times but disarmingly effective when personal details and questions regarding bank balances and sexual orientations flicker on-screen in the wake of the NSA and Snowden. The kinetic visuals and political message would fall flat if the band couldn’t deliver live, but they meet requirements with aplomb. Opener Battle Box 001 is a juddering, twitchy industrial punch, anchored by Martina Topley-Bird, whose soft ethereal vocals deliver quieter highlights in the form of 2010 single Paradise Circus, a down-tempo haunting ballad, and the ubiquitous Teardrop, which triggers a grandstanding of couples waving slowly in the air. But other vocalists shine too; regular collaborator Horace Andy delivers two storming tracks in the shape of the bass-rumbling Girl I Love You and live favourite Angel; support act Young Fathers join the band for the final two tracks of the encore, both new tracks from Ritual Spirit, including Voodoo in My Blood, a number that flirts with the idea of being a bona-fide pop track for a few oddly tantalising seconds. Massive Attack, live with Martina Topley-Bird in 2010. The new material is strong – the eerie Ritual Spirit is softly spoken, and He Needs Me is one of their best tracks in years – but the absence of some big hits is keenly felt. Nothing from Blue Lines makes the cut, with the absence of such genre-defining tracks as Safe From Harm and Unfinished Sympathy noticeable as the show winds towards its conclusion. But Robert Del Naja and Grant Marshall, better known as 3D and Daddy G, steer their ship in such as decisive manner that, as the throb of Inertia Creeps and Risingson blows up around them with palpable electro-menace, it feels somewhat boorish to criticise them for it. They do deliver the dub-indebted Karmacoma near the close, and the place erupts. Twenty-five years after they burst out of Bristol, Massive Attack have pulled off the unfeasible trick of making a live concert into a political examination; but when they’re this engaging to watch, it’s difficult to do anything other than applaud.